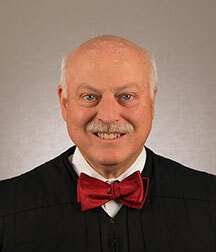 Common Pleas Court Judge Jerome J. Metz Jr.
To set a hearing: on a civil case, contact the law clerk; on a criminal case, contact the bailiff. A file stamped courtesy copy of the motion should be provided to the Court. We handle criminal motions in the mornings and civil motions in the afternoon. Motions are heard every day of the week at the convenience of the parties. In general, all motions are set for hearing unless otherwise requested. Regarding both criminal and civil matters, I encourage the attorneys to reach a resolution on their own, however, I am happy to get involved in negotiations. The Court will not take an active role in settling cases where the trial is to the bench. If the case is scheduled for jury trial, the Court will conduct a settlement conference at the request of the parties. Motions for continuances of the pretrial and trial in civil cases must be made in writing and supported by evidence even if both parties agree. The matter must be set for hearing by contacting the law clerk. Continuances of the pretrial and trial are rarely granted. The Court uses a standard case management order that it expects the parties to strictly follow in civil cases. Case disposition scheduling orders may be entered in criminal cases. Pretrial statements that comply with Local Rule 15 are required at all civil pretrials and a copy should be dropped off in the courtroom three days before the pretrial. We will discuss the case, settlement negotiations, and readiness for trial, including any pretrial motions. The Court prepares criminal jury instructions using Ohio Jury Instructions. For civil cases, attorneys should consult and jointly propose jury instructions with citations to OJI or relevant case citations at least 3 days before trial. Where the parties disagree, the joint instructions may include alternate proposals by each party with citations to relevant authority for each. Counsel are expected to meet, mark, and stipulate to the admissibility of all trial exhibits (to the fullest extent possible) before trial. At the beginning of trial, each party shall provide two binders of pre-marked exhibits: one, to remain at the witness stand during trial shall be the original marked exhibits for submission; the other will be a duplicate copy for the use of the trial judge during trial. A party may use exhibits in their own or any other party’s binder in questioning witnesses. I appreciate a short memorandum on significant legal or evidentiary issues. The Court and counsel conduct voir dire limited to a reasonable time and scope. In appropriate cases, I may direct counsel to present opening statements before voir dire. Exhibits are not permitted in opening statements except when the attorneys agree or the exhibits have already been admitted. For deposition testimony, videos are welcome. I prefer transcripts in trials to the bench unless the video deposition includes a demonstration. I expect timely discovery under the Rules of Civil and Criminal Procedure. In civil cases, the Court and the parties jointly set the discovery cutoff date as part of the case management conference and scheduling order. I permit parties to agree to continued discovery after the deadline. I will not hold discovery conferences or hear discovery motions filed after the deadline. Attorneys should try to work out discovery issues between themselves if possible. Attorneys may call the Court for assistance. I expect attorneys to be prompt, courteous, and respectful at all times. Attorneys should stand when addressing the Court, questioning witnesses, and when objecting. I do not require attorneys to ask permission to approach a witness so long as it is done in a professional manner. If a case is in progress, attorneys should quietly wait for the bailiff or law clerk to approach. I expect attorneys to be prepared for trial on the day that the trial is set. If an attorney is going to be late, I expect a phone call. Professional attire is expected of counsel and appropriate attire is preferred for all others. I expect everyone in the courtroom to be courteous toward all others there.